Vitamin D is really a hormone! It is not like other vitamins, which need to be in the diet. Cholecalciferol (the scientific name for vitamin D) is made by the skin with exposure to sunlight, and like other steroid hormones (such as cortisone and testosterone) has intracellular receptors in many kinds of cells, resulting in multiple actions. Also like other steroid hormones, vitamin D can be easily absorbed orally. A normal person does not need to ingest any vitamin D if his or her skin is exposed to enough sunlight. However, in northern latitudes there is not enough direct sunlight most of the year, and even in southern areas people may wear protective clothing, stay indoors, or use sunscreen so they don't make enough vitamin D in the skin. Also, as people age their skin does not form vitamin D as well. In November 2010 the Institute of Medicine released a report from an international committee of scientists. This long and detailed report is available on-line. Dietary Reference Intakes for Calcium and Vitamin D. Currently I think these are the doses that should be used. There are still unanswered questions about vitamin D, and many clinical trials are in progress. Details are at ClinicalTrials.gov. One large ongoing study is sponsored by the NIH and has enrolled over 20,000 subjects. Here is a link to their study website: VITAL study. AUGUST 20, 2018: Read a story about the money behind the vitamin D fad from the NY Times. This investigative report stated that Dr. Michael Holick was making thousands of dollars from some of the laboratories that measure vitamin D, as well as from pharmaceutical companies and tanning salons. For example, $1000 a month from Quest labs (which continue to say the vitamin D levels lower that 30 ng/ml are insufficient), and $163,000 over the last 4 years from drug companies, and at least $150,000 from an Indoor Tanning Association. Americans spend $936,000,000 on vitamin D in 2017, and Medicare has pain $365,000,000 for vitamin D blood tests (many of which were not necessary). Sources of vitamin D include: natural sunlight, oily fish, some mushrooms, and fortification of foods, particularly dairy products and some cereals. The radiation that converts vitamin D in the skin is the same wavelength that causes sunburn, so careful application of sunscreen can inhibit vitamin D production. After the age of 70 the skin does not convert vitamin D effectively (MacLaughlin J). Vitamin D levels also depend on the altitude (higher levels in the mountains), and body weight (obese people have lower levels than thin people). People with pigmented skin do not form as much vitamin D from sunlight, and they have lower levels of total vitamin D, but they may have normal levels of the free or active hormone (see the page on ethnic differences). The IOM report stated "Thus, although the available, emerging evidence would suggest that there is perhaps a lower requirement for calcium and vitamin D among African Americans relative to ensuring bone health, at least compared with whites, there is a notable lack of high-quality and convincing evidence to act on this possibility or to set different requirements for persons of African American ancestry." The new report lists the upper limit of safety at 4,000 units/day. However, this is based on limited evidence. Studies of high doses have lasted only a few months. Many vitamin D supplements also contain high contents of vitamin A - and recent studies show that vitamin A can increase bone resorption. The labels do not have to list the vitamin A, but it is often there, especially if it comes from cod liver oil. Cholecalciferol (animal form, also called vitamin D3) is preferred to ergocalciferol (plant form, called vitamin D2) because it sustains blood levels for a longer time (Armas, Glendenning P). Binkley N, Low Vitamin D status despite abundant sun exposure. 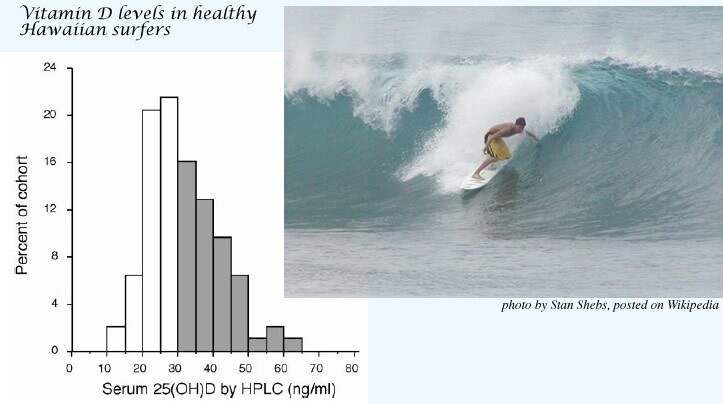 The above graph shows results from 93 healthy young (average age 24) patrons of a skateboard shop in Hawaii. The authors of this paper concluded that: "the goal of vitamin D replacement therapy should be no greater than the maximum that appears attainable, a serum 25(OH)D concentration of approximately 60 ng/ml." However, many laboratories currently have listed their "sufficient" range as 32-150 ng/ml. There is no evidence that levels above 50 ng/ml are beneficial and they are probably not safe. There is disagreement about whether the lower limit of the optimal vitamin D levels should be 20 or 30 ng/ml. This is really different from ten years ago, when levels above 15 ng/dl were considered sufficient. The recent Institute of Medicine Report finds that levels above 20 are adequate, but they acknowledge that there is not enough research in dark-skinned populations. In another paper, Binkley N found differences among the laboratory tests for 25(OH) vitamin D of around 5 ng/dL, and approximately 10% error within the same lab. These errors must be taken into account when interpreting the vitamin D levels. 1,25(OH)2 vitamin D [1,25-D] is more difficult and expensive to measure than 25(OH)D; moreover, it is not a good measure of vitamin D status. When patients are vitamin D deficient, the parathyroid hormone increases and drives the renal 1-alpha-hydroxylase, so that 1,25-D levels increase. Only in severe deficiency, when substrate is depleted, does the 1,25-D become low. Partially treated vitamin D deficiency also results in marked elevations of 1,25-D levels. some cases of nephrolithiasis or hypercalciuria. Patients with stages 4-5 chronic kidney disease have decreased 1,25-D levels but even in those patients the 25(OH) vitamin D is a better test of the stores of vitamin D, and the PTH is a better indicator of mineral abnormalities. Finally, some cells generate intracellular 1,25-D to fight tuberculosis, suppress cancer growth, or modify immune response. They need adequate substrate, as measured by 25(OH) vitamin D.
Melamed ML followed 13,331 adults in the US for 8.7 years to see if the vitamin D level was related to mortality. Notice that the mortality increases with either high or low levels of vitamin D (just like some of the other steroid hormones). Michaelsson K found that in elderly men the mortality rates were increased at both high and low vitamin D levels, and the lowest mortality was seen with vitamin D between 24 and 34 ng/mL. Another study (Dobnig H) from Germany found lower mortality in people in the top 25% of vitamin D levels, compared to those with the lower 25%. The overall levels, however, were quite low; almost everybody was lower than 33 ng/ml. A meta-analysis of clinical trials of vitamin D (average dose was about 500 units/day) found an overall reduction in mortality of 7% (Autier P). 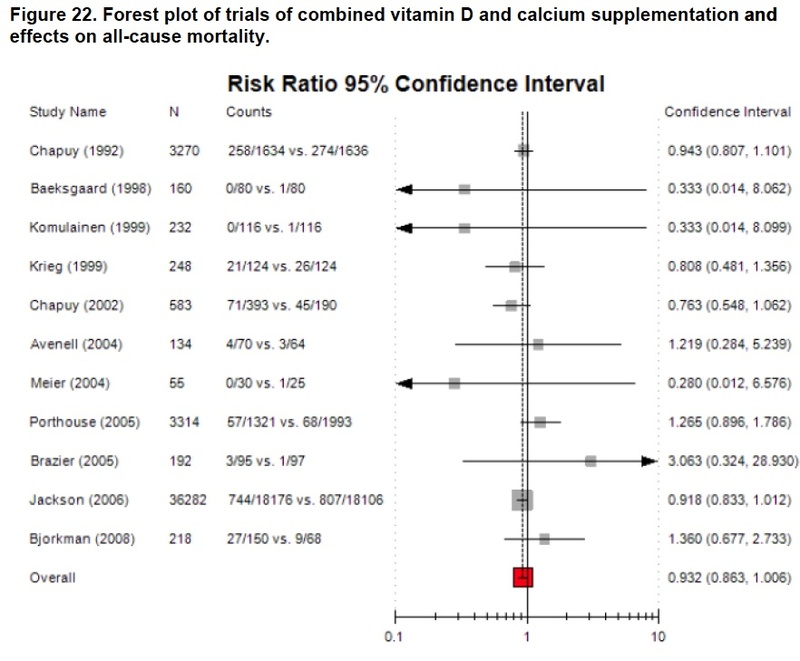 Click to enlarge this Forest Plot of mortality from randomized trials of vitamin D. Overall there was a non-significant decrease of 7% in the vitamin D groups compared to placebo (Chung) This report was sponsored by the US Agency for Healthcare Research and Quality. This table shows overall results of studies of vitamin D and fracture rates. Most of the studies did not find a signficant benefit of vitamin D.
Click on the table to download an Excel file with more details. Recently there have been several meta-analyses of this topic, which show different points of view. After reading these studies and analyses, I conclude that vitamin D therapy can reduce fractures in frail elderly patients, especially when they have vitamin D insuffiency, and that adequate calcium intake is also needed. Otherwise, the difference in fracture rates is really quite modest in the vitamin D clinical trials. Byers T. Anticancer vitamins du Jour--The ABCED's so far. Am J Epidemiol 2010;172(1):1-3. The July issue of this journal was devoted to careful analysis of the relationship between vitamin D and various cancers. This editorial should be read by everybody who has been advocating huge doses of vitamin D.
The Vitamin D Pooling Project included 10 cohorts around the world, and studied between 500 and 1300 cases of less common cancers: endometrial, kidney, lymphoma, ovarian, upper GI, and pancreatic. There was no benefit of higher vitamin D in any of these cancers. Of concern, however, was an increased risk of pancreatic cancer when the serum vitamin D level was greater than 40 ng/mL (100 nMol/L). 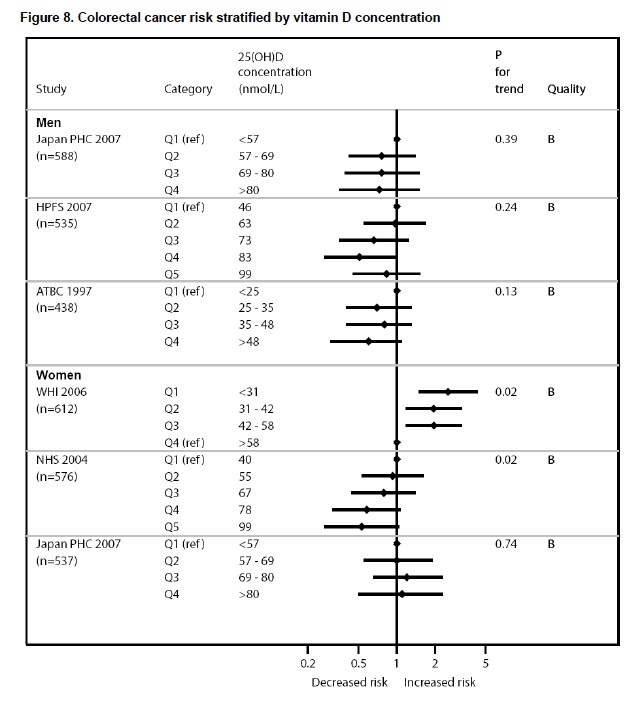 Vitamin D probably protects against colon cancer (Wei MY, Giovannucci E,Freedman DM). 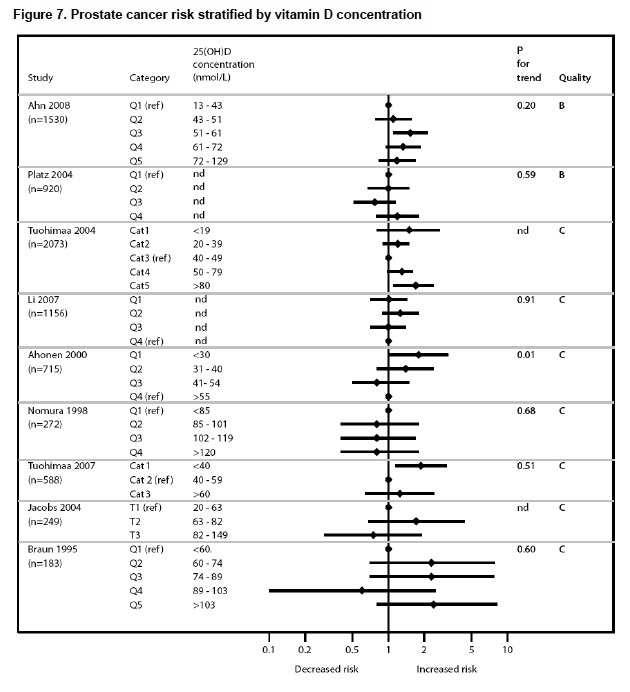 Click to enlarge this Forest Plot of colon cancer from studies of vitamin D. (Chung) This report was sponsored by the US Agency for Healthcare Research and Quality. 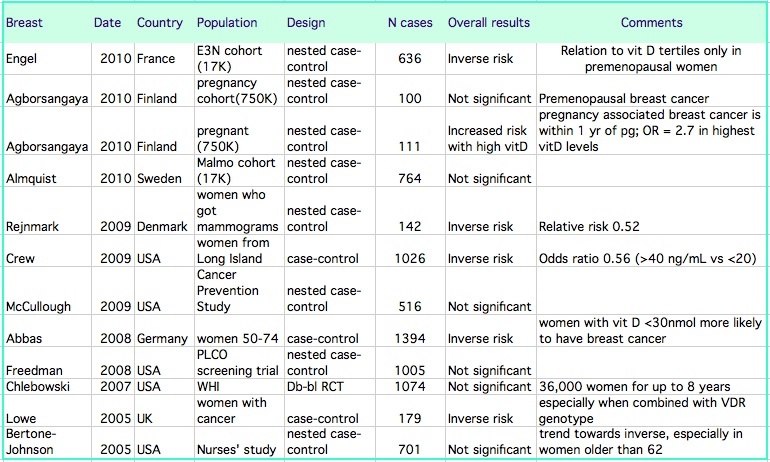 Since then, a large nested case-control study in Europe found an increased risk in men with low vitamin D (Jenab M; results are shown on the image above). 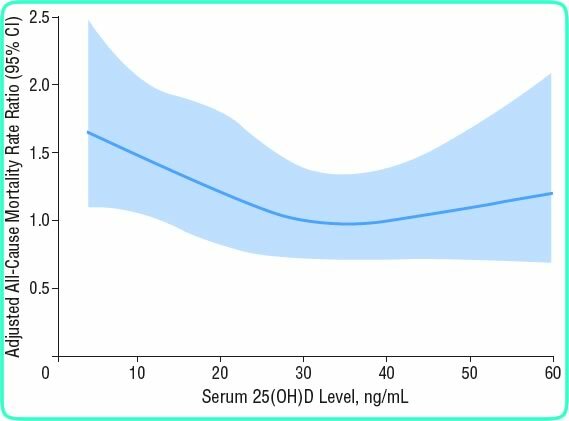 Another study looking at different ethnic groups also found lower risk of those in the lowest quintile of vitamin D (less than 16.8 ng/ml), but no difference in the other 80% of patients (Woolcott CG). 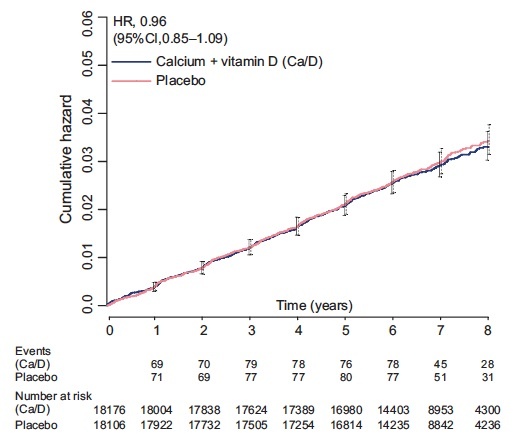 In the Women's Health Initiative randomized clinical trial of calcium and vitamin D, which included 36,000 women, there was no difference in the incidence of breast cancer between those assigned to placebo or to calcium and vitamin D (Chlebowski RT). Click on the thumbnail to enlarge the graph from that study. However, if the intake of vitamin D included the supplements taken by the subjects, then those with the highest intakes had higher risk of breast cancer. Early studies suggested the men with low vitamin D levels were more likely to get prostate cancer, but newer, larger studies do not find this. Click to enlarge this Forest Plot of prostate cancer from studies of vitamin D. (Chung) This report was sponsored by the US Agency for Healthcare Research and Quality. In the large Prostate, Lung, Colorectal and ovarian cancer screening trial (PLCO), the risk of aggressive prostate cancer was higher in men with higher vitamin D levels, as shown in the colored graph above (Ahn J). Two other studies show no significant benefit of vitamin D - one was a case control study of men with different ethnicities, including 329 cases (Park SY) and the other a large nested case control study from the European Prospective Investigation into Cancer and Nutrition (EPIC) study, which included 652 cases ( Travis RC).